At left, Michelle plays a reception for Steve Young at the Fairmont Hotel Penthouse, San Francisco. "It was so nice to meet you and please just know that if I ever hear of anyone needing music, I will absolutely send them your way." Michelle Sell enjoys an extremely active career as a professional harpist. Since 1977, Michelle has played an average of 150-200 professional engagements per year. She has performed for the Queen and King of Thailand, the Grand Duke and Duchess of Luxembourg, former President Jimmy Carter, Academy Award winning director Francis Ford Coppola, rock star Sammy Hagar, and former SF 49'er quarterback Steve Young. Although Michelle is an alumna and former faculty member of San Francisco Conservatory, where she studied classical music with Marcella DeCray, she is also an award winning "pops" and jazz harpist. Her styles are diverse and extensive, ranging from Bach to Cole Porter. Michelle is also a composer for Omni Music in New York. 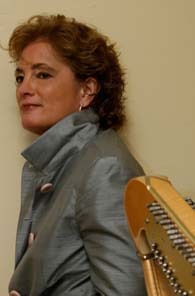 Her original compositions have been used on television, radio, and in motion pictures. 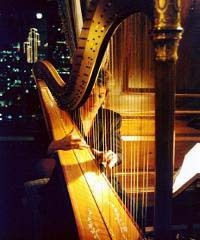 For private engagements, Michelle frequently uses a Camac electro-acoustic harp. Every string on this harp has a pickup or small microphone. This enables the harp to be heard - clearly - in venues seating hundreds. in contrast, at venues with just a few people, it is an intimate background instrument. Michelle believes that her clients are entitled to professionalism, punctuality, courtesy, and above all, the ability to hear the music for which they are paying. At large venues and at outdoor functions, a traditional acoustic harp may be difficult to hear if not amplified. There is no extra charge for using the Camac electro-acoustic harp and its amplification system. Whether it be wedding music, or event music for a fund raiser, event music for a reception, event music for a birthday party, event music for a retirement party, or even harp music for a simple afternoon tea or holiday affair, Michelle can play as a soloist or with flute, cello, bass, guitar, violin, or saxophone. Classical flute and harp are beautiful accompaniments for your wedding ceremony, while soprano saxophone, bass guitar, and harp are fabulous for your lively "jazzy" wedding reception. Michelle's local Bay Area venues cover Alameda, Contra Costa, Marin, San Francisco, San Mateo, Santa Clara, Solano, and the Wine Country Counties of Napa and Sonoma. More specifically, some of the cities and towns in which she plays are the following: Woodside, Walnut Creek, Vallejo, Sunol, Sunnyvale, St. Helena, South San Francisco, Saratoga, Santa Rosa, Santa Cruz, Santa Clara, San Rafael, San Jose, San Bruno, Redwood City, Pittsburg, Pinole, Petaluma, Palo Alto, Oakland, Novato, Napa, Mountain View, Monterey, Menlo Park, Marin, Los Gatos, Los Altos, Healdsburg, Hayward, Half Moon Bay, Guerneville, Geyserville, Fremont, Emryville, Dublin, Danville, Daly City, Concord, Carmel, Calistoga, Burlingame, Berkeley, Atherton, Antioch, and Alamo. All I Ask of You, Theme from "The Phantom of the Opera"
Beauty and the Beast, Theme from "Beauty and the Beast"
Bella's Lullaby, Theme from "Twilight"
Can You Feel the Love Tonight, Theme from "Lion King"
Colors of the Wind, Theme from "Lion King"
Married Life, Theme from "Up"
And of course, Michelle can play her original CD compositions. Michelle can also compose original music for your wedding or other event. 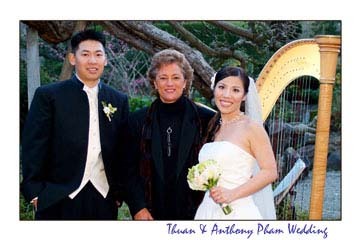 "After talking to other harpists, we really wanted to go with you because you truly cared about making our day special. I had a good feeling after interviewing with you and my intuition was correct!" Thuan and Anthony T, Wedding Clients, Hakone Gardens, Saratoga, Ca. "You were amazing! All of my worries and fears just melted away. You have no idea what an incomparable feeling of exhilaration it was to walk out there to my favorite music in the world and to hear it played so unbelievably beautifully. Deepest and warmest thanks again for everything, Michelle...."
Ann M and Chris F, Wedding Clients, Alta Mira Hotel, Sausalito, Ca. "Your music is and was very gorgeous! There are no words to express the way you played so beautifully." Victor and Priscilla H, Wedding Clients, Commodore Marina, Alameda, Ca. "You were phenomenal! The harp music you played was beautiful and so romantic. Again, thank you for all your work!" Jenny and Chris, Wedding Clients, Dublin Ranch Golf Course, Dublin, Ca. "It was great meeting you at the pre-wedding session and, thankfully, you thought of every detail! Thank you for your attention to detail and making the day wonderful for us! Please let us know if you ever need references!" Melissa and Ian, Wedding Clients, Stern Grove, San Francisco, Ca. "We just got back from our honeymoon, and I wanted to write a quick word of thanks for the lovely music you played at our wedding. Thanks again for helping to make our wedding beautiful!" Corinne C, Wedding Client, Chateau Soverain, Geyserville, Ca. "Michelle, I wanted to personally thank you again for the beautiful music you enchanted my wedding day with. It was absolutely breathtaking! On our wedding video, I could stop and rewind parts over and over and absolutely love hearing your talent. You're so amazing!" Chrstine and Matt; Wedding Clients, St. Raymond's Catholic Church, Dublin, Ca. "Thank you for playing your harp during our ceremony. We appreciate your professional attitude during the consultation, music selection, and wedding day. We're so glad we found you!" "Thank you again for being part of our special day! Not only do you play the most beautiful music but you also truly seem like such a wonderful woman. It was so nice to meet you and please just know that if I ever hear of anyone needing music, I will absolutely send them your way." Deirdre M, Wedding Client, Alta Mira Hotel, Sausalito, Ca.